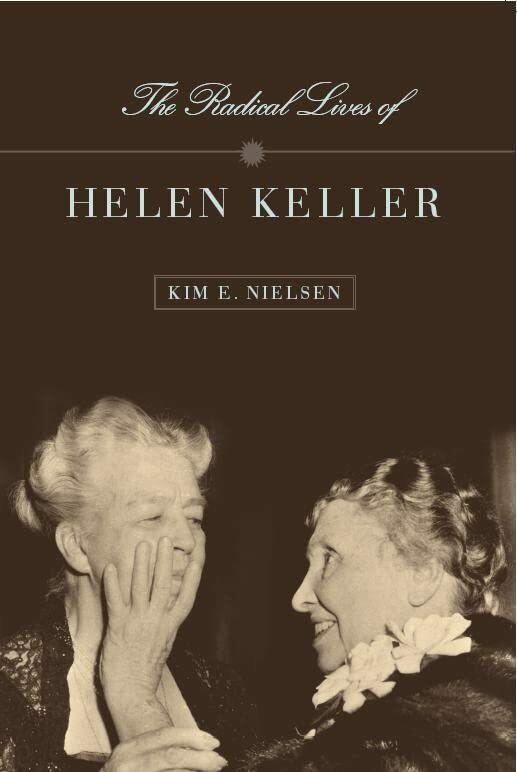 The Radical Lives of Helen Keller, by Kim E. Nielsen. New York: New York University Press, 2004. Cloth, 208 pages, $30.00. Read Fred Pelka's Helen Keller & the FBI from the Sept. 2001 Ragged Edge. For most of us, the story of Helen Keller begins and ends with her "awakening" as a small child on her family's farm in late 19th century Alabama. You know the scene. There she stands, unkempt and wild but looking remarkably like Patty Duke, as Anne Bancroft splashes water onto her fingers from a backyard pump. "Wah wah!" the child cries, and then the movie ends with general rejoicing at the "miracle" wrought by Keller's teacher, Anne Sullivan. In fact, "The Miracle Worker" is today the most popular -- and often the only -- impression Americans have of Helen Keller. Missing from Keller's politics was virtually any recognition of the discrimination faced by people with disabilities as people with disabilities. Why didn't Keller's radicalism extend to her politics of disability? Which is a shame, since Keller was a gifted writer who could turn a phrase with the best of them. Or, even more succinctly: "Rights are things we get when we are strong enough to make good our claim to them." Once, when an interviewer suggested that she might want to temper her opinions for public consumption, Keller exploded: "I don't give a damn about semi-radicals!" It is this Helen Keller, the unabashed socialist, feminist, anti-fascist and anti-segregationist, who has drawn the attention of contemporary biographers, from Dorothy Herrmann and her Helen Keller: A Life (Alfred A. Knopf, 1998) to Kim E. Nielsen's book reviewed here, the newest addition to the canon of Keller studies. Nielsen's book is the latest in the History of Disability Series edited by Paul Longmore and Lauri Umansky, and it raises the fundamental question of why Keller's radicalism did not extend to her politics of disability. Indeed, as Nielsen points out, missing from Keller's politics was virtually any recognition of the discrimination faced by people with disabilities as people with disabilities, the sort of insight arrived at, for instance, by her left-leaning contemporary Randolph Bourne, and later on in her life by Jacobus TenBroek. Nielsen's attempt to explain this seeming contradiction begins by tracing the influences on Keller's education. She describes how Keller's isolation from the Deaf community, arguably the best organized disability constituency of the time, was pivotal in how she perceived herself as a person with a disability. This isolation was deliberate, since her education from the start was directed by Alexander Graham Bell, inventor of the telephone and arch-enemy of Deaf Culture. Bell was an ardent supporter of "oralism," an ideology that sought to suppress any use of American Sign Language. Oralists insisted -- wrongly, as it turned out -- that signing inhibited one's ability to learn language, and for close to a century entire generations of deaf children were stunted in their education and isolated from their peers by this attempt to force them to lip read and to speak like "normal" people. And so Bell, consulted by Keller's parents, steered them toward the Perkins School ! for the Blind (and its "star pupil" Anne Sullivan), and away from centers of Deaf culture such as the American School for the Deaf. Bell became a friend and father figure for Keller, and she adopted much of his take on disability. As a result, Keller has become primarily identified with the blindness community, but even here she preferred to work with organizations for the blind rather than of the blind (serving as spokesperson and fundraiser for the American Foundation for the Blind). As Nielsen points out, Keller rarely associated with other people with disabilities, aside from her "teacher" Anne Sullivan, preferring instead a circle of progressive but non-disabled friends. Her very fame as "archpriest of the sightless" and "wonder woman" (these were the actual phrases used to describe her), while enabling her to earn a living, meet the rich and famous, and tour the world, also made her a prisoner of others' expectations. Keller "became mired" in what Nielsen aptly describes as "the performance and ideology of perpetually overcoming her disability." "An alliance with other people with disabilities would have destroyed [Keller's] public image as a one-of-a-kind miracle." It would have compromised her status as the world's foremost super-crip. Keller paid a high price for this "inability to politicize" her disability, both personally and politically. Her super-crip identity not only kept her from identifying with other disability activists, it also limited her ability to advocate for the various non-disability causes in which she so passionately believed. In an open letter to Socialist presidential candidate Robert La Follette, Keller explained how she was widely and extravagantly complimented for her "social service" on behalf of "the blind" but "when it comes to a discussion of poverty, and I maintain that it is the result of wrong economics....that is a different matter!" Her "Miracle Workee" identity likewise limited the ways in which even sympathetic feminists, labor activists and socialists perceived Keller. Nielsen cites as an example Emma Goldman, who saw Keller as "an inspirational novelty, not a comrade." The result was to restrict Keller's disability experience to that of "personal tragedy that generates either sainthood...or...degeneracy. Both of these cultural memories mark disability as the exception, the unusual, and the Other." Nielsen's account of all this is thoroughly researched, well organized and extremely well written. If I were to make any complaint at all it would be that her book, at only 142 pages (and another twenty-some-odd of endnotes), is too short. At several places I felt that Nielsen, obviously a world-class authority on Keller, could have allowed herself more room to elaborate, even to speculate. But this is small criticism of a truly important and exciting work. Writing in protest against the rounding up of labor and antiwar activists during World War I, Keller urged her fellow Americans to "keep an open mind. Let us try to preserve the integrity of our judgment against the misrepresentation, ignorance, and cowardice of the day." These words ring as true today, in our era of "homeland security," as they did in 1918. It is a shame that Keller never extended to her disabled self that same open mind and integrity of judgment she practiced so well for others. For those who want a dose of Keller's politics firsthand, I recommend Helen Keller: Her Socialist Years, edited by Philip S. Foner (International Publishers, 1967). Read Fred Pelka's Helen Keller & the FBI from the Sept. 2001 Ragged Edge. Pelka is the author of The Disability Rights Movement (ABC-CLIO, 1997) and editor of the forthcoming The Civil War Letters of Charles F. Johnson, Invalid Corps, to be published later this year by the University of Massachusetts Press.